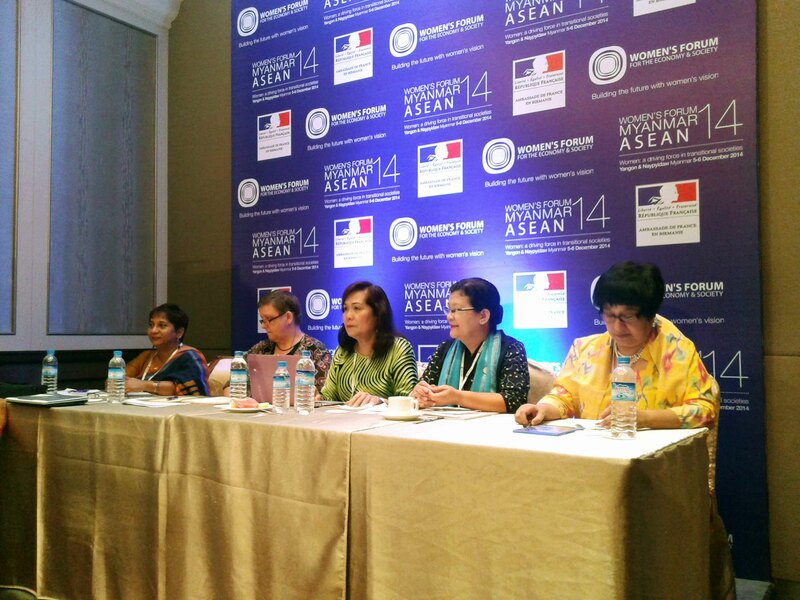 The second edition of the Women’s Forum Myanmar – ASEAN 2014 was held in Naypyidaw and Yangon on the 5th and 6th of December 2014. This programme was a joint effort of the Women’s Forum Myanmar together with Women’s Forum for the Economy and Society (WEFCOS) and the Government of Myanmar. There were over 800 participants that joined the Forum this year from South East Asia, Europe and North America. At the Women’s Forum Dr. Sepali Kottegoda, Executive Director of Women and Media Collective was on the panel ‘How to Cope with Climate Change: Women at the forefront of disaster prevention and management’. She was joined by Prof. Dr. Khin Ni Ni Thein, Secretary of Water Expert Group and Member of National Water Expert Group Committee, Republic of the Union of Myanmar, Christa Raeder, Bangladesh Representative and Country Director, UN World Food Programme and Dr. Jean D’Cunha, Senior Gender Advisor/Manager, Focal Point for UN Women, Office of the Resident Coordinator of Myanmar, United Nations. The panel was moderated by Dr. Corazon Claudio, Chair / President EARTH Institute Asia. Being an island nation Sri Lanka is becoming more vulnerable to climate change. Women of rural areas are not only a susceptible group to natural disasters but they are also recognised as a crucial player in the mitigation of climate change.